I’ve been waiting for an occasion to make this dessert for a while, but nothing ever seemed right. Then yesterday I realized a simple meal with good friends is always an occasion to eat a pretty dessert. This has a lot of components, but each of them is very easy to do, and a lot of it can be done in advance. 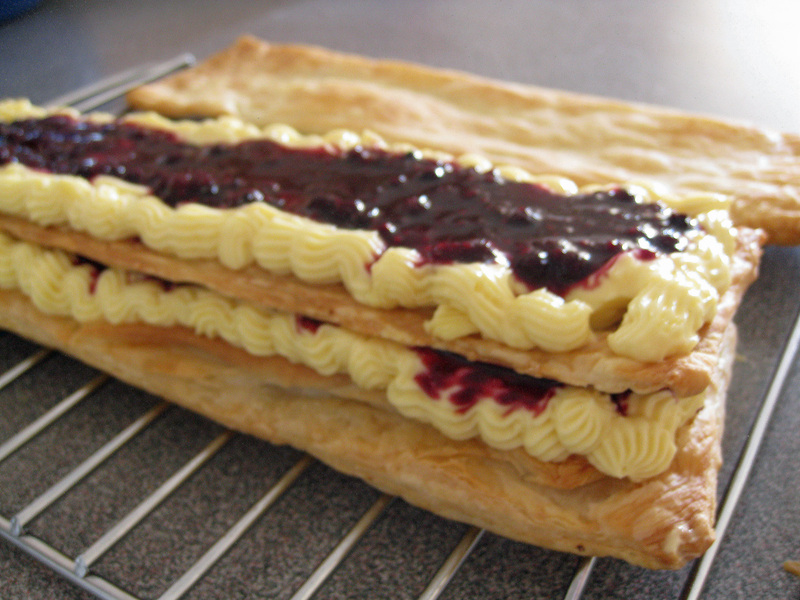 I based this recipe on Anna Olson’s Cranberry Mille Feuilles. I have to say this was yumm-ie. I had the leftovers for breakfast this morning (I think that’s fine because it has fruit and the custard is made with eggs and milk, so I got all my major food groups). I sent Janice a sneak preview pic, and she asked me to let her know if I figure out the optimal way to eat mille feuilles. I don’t think there is an optimal way, you just have to get your hands in there and hope not to make too much of a mess. If anyone out there has a technique, please let me know. Put milk, cream, vanilla and lemon strips in a large sauce pan. Bring to a simmer. Meanwhile, in a large bowl, whisk egg yolks, sugar and cornstarch together. Once milk has simmered, add it to egg mixture one laddle full at a time, whisking constantly. Be careful not to add to much hot liquid in the first addition so that the eggs don’t scramble. Return the mixture to the sauce pan on medium high heat. Whisk vigorously until the custard has thickened. Cover with plastic wrap and cool. Once completely cooled pull out lemon pieces and fold in whipped cream. Cover in plastic wrap and refrigerate until ready to assemble. Put all ingredients in a large sauce pan. Bring to a boil for 5 minutes, then let simmer for 10 minutes. Stir often. Cover in plastic wrap and let cool till ready to assemble. Cut the puff pastry into 3 equal sized pieces. Roll each out till 1/4 cm thick. Cut them into equal sized shapes ( I did rectangles because that way they would all fit on one baking sheet, Anna did an 8 inch squares). Place puff pastry on a baking sheet, dock the pastry (poke little holes with a fork), cover with parchment paper and then weight the pastry (I used beans, if you have another baking sheet that will fit on top that works too). Bake with the weights for 12 minutes. Remove weights and bake for 10 to 12 more minutes. Let cool completely and assemble. On one layer of puff pastry, spread half of the pastry cream, and then top with the fruit mixture. Top with second sheet of puff pastry, and cover with remaining pastry cream and some of the fruit mixture. 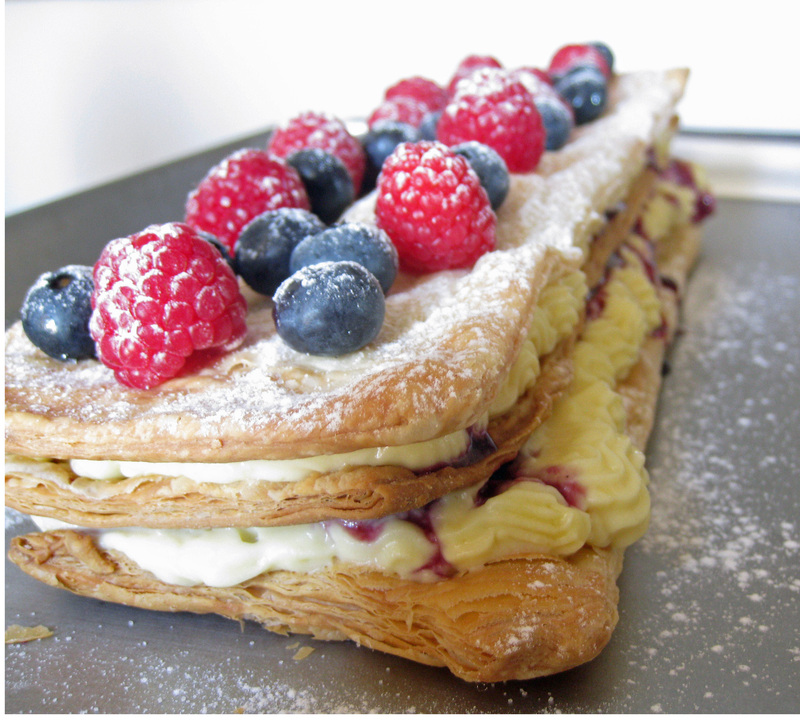 Place last sheet of puff pastry, top with some fresh berries and a dusting of icing sugar. The original recipe called for one layer of cream and one layer of fruit, but my fruit mixture was much too liquidy for that to work. If your fruit mixture is thicker (you could add gelatin), I think that would make a very pretty presentation. The mess is part of the fun! What a delicious looking treat. My kids are sitting on my lap drooling with me! Oh my, that looks delicious. I’ll definitely be making this recipe. Bookmark! Om nom nom! What a great dessert. Love the mix of fruit.